Well, heck, Happy Holidays from everyone in Knobcone Heights, California! I don't know of anyone around here who wouldn't agree. And guess what. 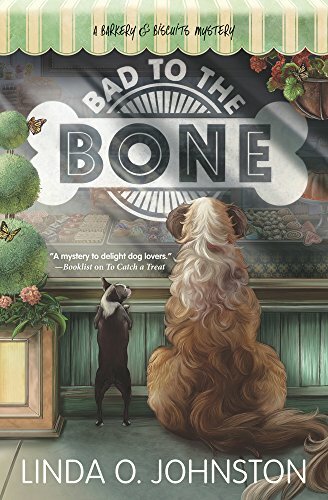 To celebrate this season, I've been told that Linda O. Johnston, the person who writes the books describing the various murders I've managed to solve around here, will be giving away a copy of my most recent adventure: Bad to the Bone. All you have to do to enter is to leave a brief comment here that tells about how you'll be spending this holiday season, most particularly with your dog(s). Also, leave your email address. Linda says she'll have one of her dogs pick the winner randomly on December 20 from those who enter. Good luck, and again Happy Holidays! My family is coming to visit this year. My daughter is allergic to dogs so I have a bunch of small pocket dogs that are everywhere. Our family along with our beloved mini Schnauzer Belle will he spending a quiet Christmas at home . We are thrilled to be spending Christmas in our new home. We took the plunge (before we got too old to do it) and moved to our dream spot - in the Ozark Mountains - and built our dream home. The 7+ acres we bought right at the edge of town with a view of the mountains had two still standing 1853 large stone fireplaces. Hubby and I drew up the plans around those two fireplaces. We downsized to a one bedroom, but with one of the fireplaces in the living room and one in our bedroom, it's perfect for us. Now they are calling for snow for Christmas! Maybe up to 4 inches. First off, where we moved from we NEVER got snow but rather ICE which was nasty stuff. On top of that I've never seen a White Christmas so this would be my first. I'm so excited and hoping the weather forecast is right. I will be more than happy to spend Christmas with the three of us cuddling on the couch by the fireplace watching it snow out the front big window which faces the mountains. We always have good meals to eat and we do and buy for each other all year so not concerned about those. Well, Snickerdoodle is but he's such a GOOD boy that I know Santa Paws will reward him with a overflowing stocking this year. We'll be celebrating with our smallish family. Our granddaughter is now 16 months, so it will be interesting to see what she thinks about all this. Our family includes on elderly, very patient cat. He and our granddaughter are great buddies. My husband and our 3 rescues will snuggle in for the Holiday. I will not be able to spend it with my dogs so they will be treated to Kamp 4 paws while we go out of state with our grandbabies and new granddaughter, too. Hope you have a Very Merry Christmas and a Blessed New Year,too. The hubby and I will be spending the holidays with our fur babies. All the presents hidden deeply in closets are for the dogs---so they can't go under the tree or they would be opened already. I imagine they will get a little taste of our Christmas dinner, too---a small slice of prime rib for each of them. I go to my Sisters as does the whole family for Christmas. Her little Scottie takes center stage and wants everyone to play with him. Lots of fun. Would love to read "Bad to the Bone" and more about Biscuit. I'm spending Christmas with my Sister and her wonderful English Pointers, Polly and Robin. I already have their gifts packed. Family Christmas with treats from the pet bakery for Toby and Belle. I don't have a dog, but I will be visiting family (parents & a cousin) who have dogs. I think we'll have a quiet holiday, maybe hosting my recently bereaved best friend. No puppy dog right now, but maybe one of these days. Happy holidays to you and yours! I'm spending time with family. I'm sure the neighbor's dog will join in at some stage. I just LOVE your books! I read the first in this series and just loved it. I have the second and third on my list to get, but, haven't bought them as of yet. My Husband and I will be just be spending Christmas with each other, a quiet day at home. I am doing chemotherapy, have been for over 15 years now, and I just try to push myself along and it seems that I don't do much as i used to. I lost my last dog a few years back, and right now I don't have one. So, it is just the two of us. I love reading and always take my books to my chemo infusion suite, and when I am through with the books, I leave them for the other ladies to read. Keep up your wonderful stories! I want to read all of your series, one of these days, I will get there! Happy Holidays! We will have a quiet Christmas Day, but then family comes and it will be fun, fun, fun with Grands! We will be sharing a Holiday get together with our dog and four cats and family. It should be a full house. Happy Holidays . Love the cover on this book. All eight of our children will be back home and we will spend it reminiscing about funny family stories and enjoying great food! The winner has been picked! It's Eileen A-W. Thanks to all of you for commenting, and both Linda and I hope you have a great holiday season.